We picked up the bees Saturday morning in New Waverly. The chap and his son were out in front of their building with masses of boxes of bees and nukes piled up. It felt quite odd driving back to Houston with a box of bees, I was surprised that we couldn’t hear them. When we got home we put the box in the shade of a large tree by the hive. I went in to study and wait for Dean who made our hive, to come and show us how to put them in the hive. All of a sudden DeAun walks in and announces “the hive isn’t level any more.” Quick panic since it was 10 minutes before Dean was due to arrive. We grabbed a level, a bag of sand, and more newspaper and set about leveling the hive. Once level we heaved a sigh of relief and received a message from Dean saying he was running late. 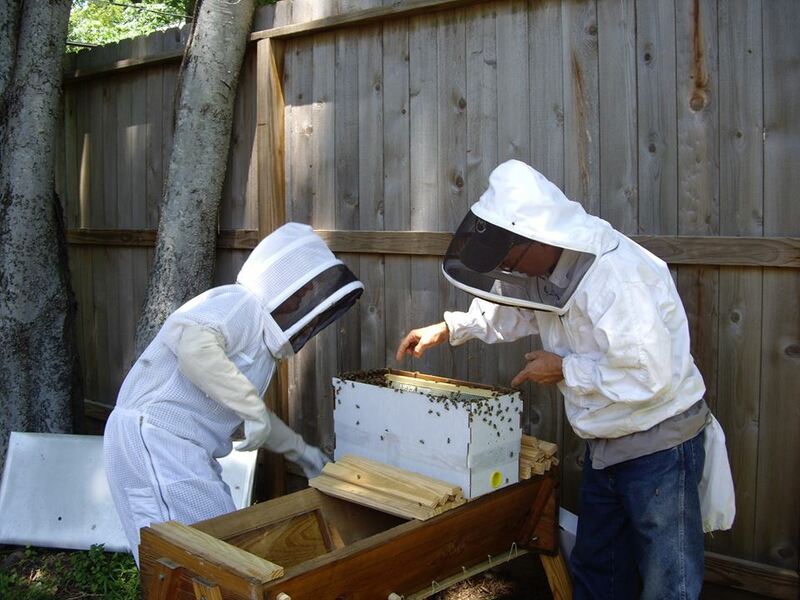 No problem, hive was level, bees were comfy in the shade……….Dean arrived, took one look at the box of bees now baking in the sun and said, “oh no.” We opened the box and saw a bunch of very lethargic bees. DeAun was ordered to rush to the house and get a spray bottle of water, after a few spritzes, we shook the box and brushed the comb into the hive. Despite looking for what seemed like a very long time, we could not spy the queen. I retrieved a paint brush to move the bees around in a quest to verify that the queen was in the hive. We couldn’t see her and Dean was not sure they were behaving like she was there. BIG PANIC…. Panic Over. The son of the seller works in Houston and came over and found the queen for us. She does indeed have a large green dot on her back. I’m not sure why we couldn’t see her before. I wonder if they were all crowding around her because of the stress of the move. Now we can heave a big sigh of relief. Bees nice and mellow. We saw the queen and got a photo. Pint jar of syrup was almost empty so we replaced it. We also put a pollen pattie in there under the recommendations of the lady who owns Wabash hardware store who is a beekeeper. The first bar had about fifteen square inches of comb. I saw some cells of nectar (I guess that’s what it was) and quite a few with yellow mat finish about half way in(capped brood). Pollen? From that bar, they decreased in size until the 5th bar which had two small pieces of comb just about 3 square inches. Bees super mellow. DeAun in the hive. Sally photoing. Weather was warm mid 80s, clear skies and a light wind. Still have the top entrance open. Will switch them to the lower entrance tonight. Building comb to bar 7, @ 4 sq in. The queen was on bar 7. Looked like mostly nectar. 6th bar – was about 3/4 across the bar; good amount of nectar and pollen and possibly some eggs. 5th bar – also about 3/4 across the top bar, some capped brood, pollen and nectar. 4th bar – close to full bar across, more capped brood, pollen and nectar. 3rd bar – still not all the way to end of bar close to entrance. much capped brood!, still some pollen around edge of brood and a bit of nectar. 2nd bar – about 2 inches away from entrance side of hive. tons of capped brood, some empty cells in middle of the brood. Pollen on top part of comb. 1st bar – not nearly as much capped brood, but a lot of nectar and pollen. 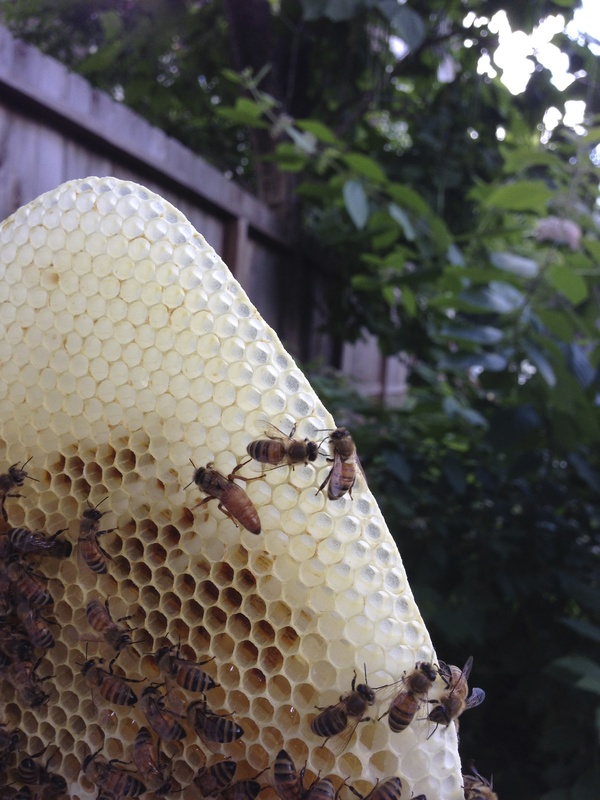 Seems like all the combs are a bit offset toward the back of the hive, not centered on the bars. Trying to correct for the skewed comb we added a 1 1/2″ bar at the front of the hive and at bar 3. Also put a spacer after, what is now the 9th bar. Uncovered the screen bottom to enhance the bees auto air conditioning capabilities . Bees super mellow. Sally in the hive. DeAun photoing. Weather was warm mid 80s, mostly cloudy, a light wind, slight threat of rain. Building comb to bar 9, @ 12 sq in. Has a few capped honey and the rest is nectar and a touch of pollen. 8th bar – did a little comb correction where it was curving onto bar 9. Close to full bar across, a bit of capped honey at the top, a bit of capped brood, and some pollen and nectar. 7th bar – did a little comb correction where it was curving onto bar 8. Close to full bar across, some capped honey at the top, a bit of capped brood, and some pollen and nectar. 6th bar -full across top of bar and very deep, 3 to 4 rows of capped honey at top, a bit of capped brood, pollen, and nectar. Think some brood may have hatch out on this bar (was 4 before inserts). 1st bar – was added 5/21/14 and has no comb. Sally got her first sting! The bees were not as welcoming as they had been. We got in the hive around 0930 it was already pretty warm maybe 85. Still just the one bottom entrance open. Activity is definitely picking up. 10th Bar – Comb 1/2 the bar across top. Much capped honey on one side the other is mostly nectar and a bit of pollen. 9th bar – comb almost across top of bar. much capped honey, nectar and pollen. a few scattered capped brood. 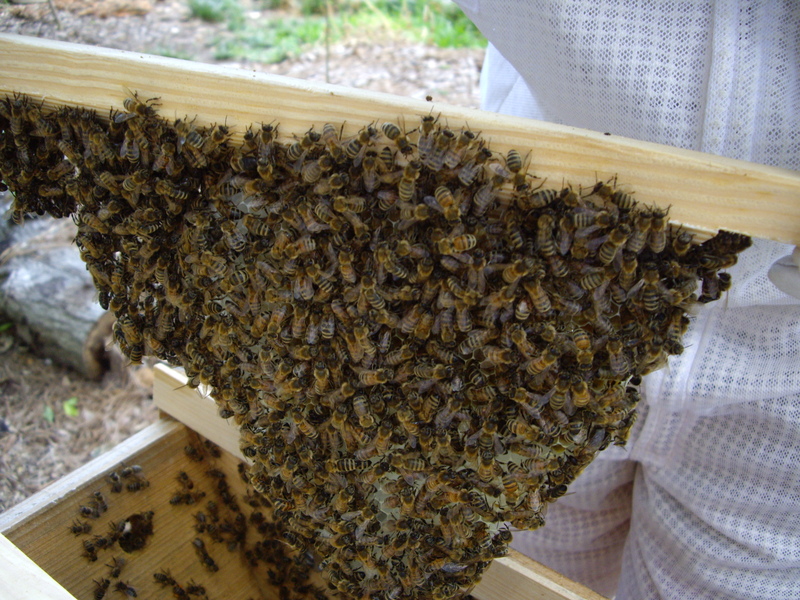 8th – capped honey at top, nectar and pollen. capped brood but also about 5 queen cells in middle of comb. 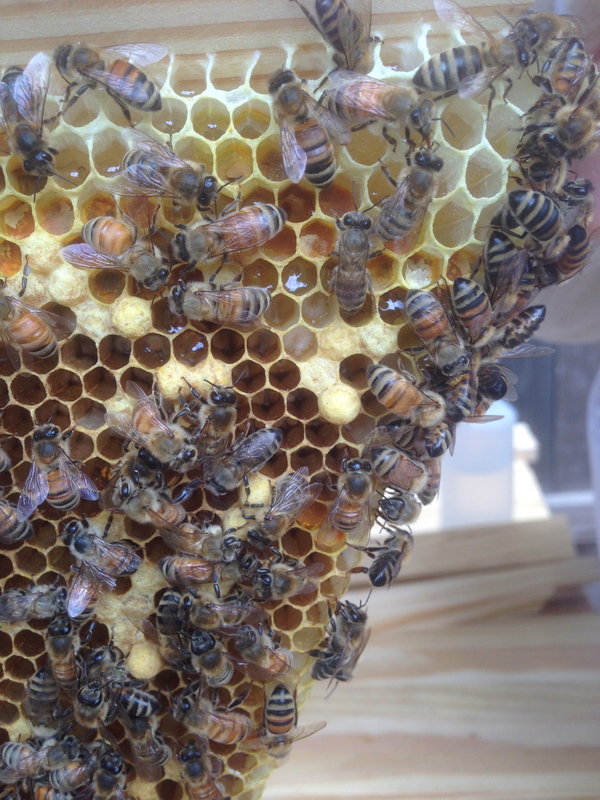 7th – much like 8, also about 5 queen cells. Not sure if any of the queens are capped. 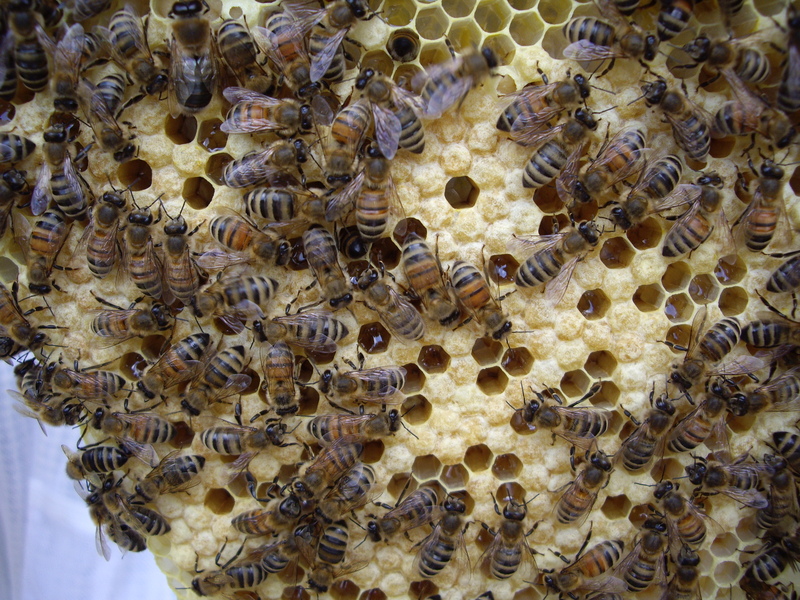 6th – also honey at top, some capped brood, nectar and pollen, one queen cell. 5th – this one was added 5/30. was larvae, nectar and pollen. looked like he start of one queen cell. We stopped due to agitated bees. We added a new 1 1/2 bar at #7. The bees were much calmer today. We were in the hive early again and it was already in the mid 80s and sunny. We think the new queen hatched today she is a bit on the small side. still a few capped queen cups. 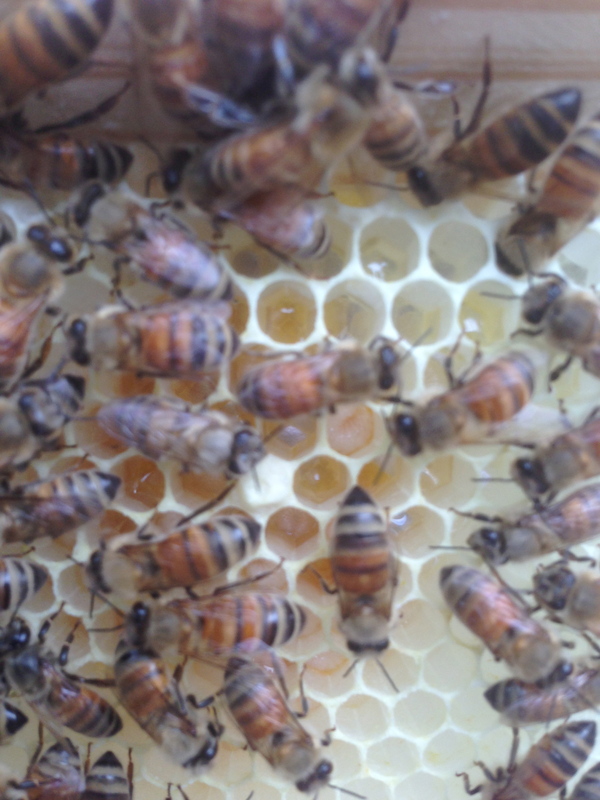 Hoping the queen gets mated soon! We started at the 11th(was 10) bar – it is still fairly small with one side empty and the other side almost full of capped honey. 10th – about 2/3 of the bar, very heavy! mostly capped honey and a bit of nectar and pollen. 9th – also about 2/3 of the bar. good amount of capped honey at top with a little capped brood. 8th – about 3/4 of the bar. some capped honey and a bit of capped brood. A fair bit of pollen and nectar also. 7th – bar was added 6/8/14 and is still empty. 6th – almost full bar. much capped honey at top, nectar and pollen with a bit of capped brood. 5th – about 3/4 of the bar (added 5/30). capped honey, pollen and nectar and a bit of capped brood. 4th – 7/8 of the bar. lots of pollen and some capped honey and small amount of capped brood. 3rd – 2/3 of the bar(added 5/21). lots of pollen and some capped honey and small amount of capped brood. 2nd – 7/8 of the bar. lots of pollen and some capped honey and small amount of capped brood. We moved the 3rd bar (5/21/14) into the first spot and the 1st bar (also 5/21/14) to tenth spot. – we gave them the week off from being bothered. The bees were very pleasant. We got in the hive early to beat the heat and possible rain showers. It was a bit breezy, mid 80s and mostly clear. We did not put eyes on the queen. All but one of the queen cups were torn down. 11th bar – some capped honey at top and tons of pollen! 9th bar – about 2/3 of the bar. capped honey one side, empty on the other. 8th – about 3/4 of the bar. much capped honey. looks like some brood hatched out and a little nectar. 7th – mostly complete bar. Capped honey at top, maybe just a few capped brood. 6th – Capped honey at top of bar. 4th – mostly complete bar. Capped honey on top. 3rd (5/30/14) – 2/3 of the bar. Mostly covered in bees. capped honey at top. 2nd – mostly complete bar. Lots of bees. much pollen. 1st (5/21/14) – lots of activity. Some chaining working to build more comb, already mostly complete. So many bees hard to see what was on it. Maybe a bit of capped honey, some nectar and maybe pollen.